People have waited a long time for a new TopStyle, and to make up for this, I wanted to add one more big feature before releasing the first beta of TopStyle 3.5. I wasn't sure what to add, but then a customer named Ariba suggested that I add the ability to preview any URL using the style currently being edited. This struck me as a great idea, so I turned up the music and started coding like a madman to make this feature possible. 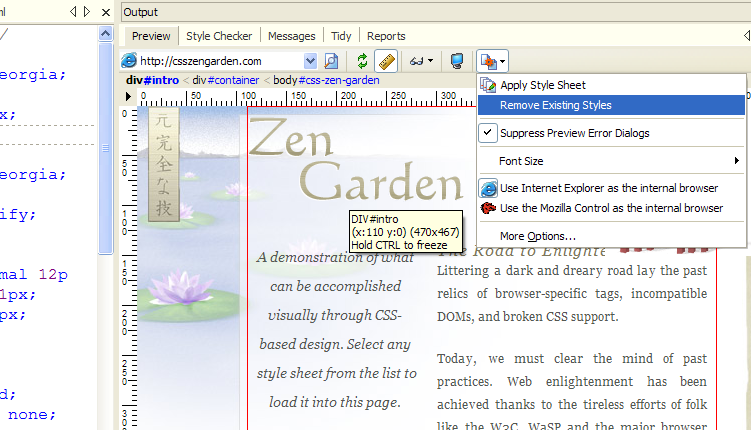 Click on the image below to see an example of this feature in action, which shows the current style sheet being applied to CSS Zen Garden. 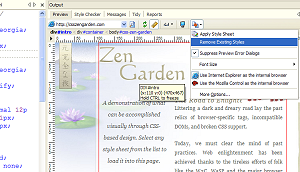 You can also choose to remove the existing styles from the external URL, so that you see the page styled solely with your style sheet. I think you'll find this feature extremely useful, especially when coupled with the new "Box Spy" feature. Nice work, I can't wait to try this new version! Wow. This and Unicode, and I'll be able to work on Drupal sites again within TopStyle. Awesome. Thank you! I second the Unicode support - it's the sole reason I started looking into other editors, since I've been increasingly dealing with Cyrillic, Chinese and similar pages. Nick, this is awesome. I'm so stoked for a new version of TS that I can hardly wait. What are the chances that you could have a Linux build as well? Sorry, Eric - chances are zero that there will be a Linux build. I've heard that TopStyle runs fine via WINE, though.